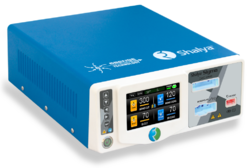 We are a leading Exporter of shalya touch screen cautery machine and touch screen electrosurgical generator 400w from Mumbai, India. User Programmable 10 user settable programs with procedure & surgeon name. Upgradability Argon Beam Coagulation, Ultrasonic Aspirator, Smoke Evacuator, Suction Irrigation module. Polypectomy, Under Water, Urology, Gynec, TCRE, Hysteroscopy, Thoracotomy, Thoracic and Cardiac Surgery. Unit is suitable for all kind of Open, Endoscopic,Laparoscopic and Minimally Invasive Surgery. 5" LCD Touch Screen allows quick, easy & interactive experience to users. Endo Cut Mode : Allows pulse interval controlled cutting for Polypectomy and Papillotomy. User Programmable 20 user settable programs with procedure & surgeon name.